Congee or rice porridge is a simple comfort as it best, and traditionally served as breakfast throughout Asia with some side dish. For this recipe, I have flavored the rice porridge with fresh red snapper fillet, ginger, soy sauce, and sesame oil. To complete the congee, top it with some freshly chop scallions and coriander. Boil the rice with water in the rice cooker according to the manufacturer’s instructions. When the congee is cooked. Transfer it into a large pot. Bring it to a boil and mix in the ginger, fish slices, and season with light soy sauce, rice wine, sesame oil, pepper and sea salt. If the congee is too thick, adjust with additional water or chicken broth. 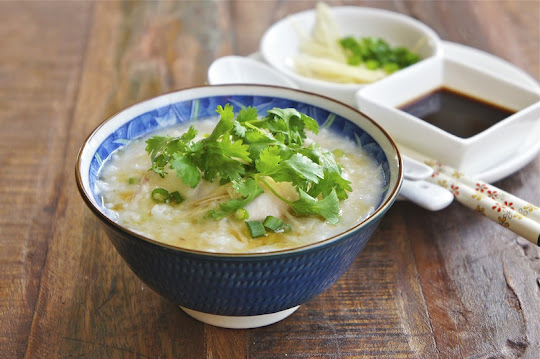 Once the fish is cooked, switch off the heat, and serve the congee warm with scallions and coriander. Congee is something that has never appealed to me. I say that never having had it. Have you converted me. I'm willing to give it a go. This will be a perfect supper food.